Scouts Concorde Summer Camp 2017! We have a fun Concorde Summer Camp planned this year at Walton Firs Activity Centre near Cobham between Thursday 27th and Sunday 30th July. Scouts will be camping under canvas for 3 nights. There will be various activities planned and these are likely to include all or some of the following (depending on availability): Caving, Crate Stacking, Rifle Shooting, Low Ropes, Adventure Assault Course and a Pioneering Exercise. Scouts will be responsible for cooking meals themselves either “backwoods” style on open fires, or on camping stoves. We will run a rota for food preparation, cooking and washing-up and tidying-up and every Scout will have an opportunity to demonstrate and improve their camping, cooking and bushcraft skills. The camp will include a mandatory full days hike offsite to the Brooklands Motor Museum which is about 1.5 hours distant, so 3 hours of walking in total. The Scouts will have plenty of time to visit the Museum, as well as take part in a Concorde Experience and the 4D Theatre. Parents will be responsible for transporting the Scouts to and from Cobham. The exact timings for drop-off and pick-up are yet to be decided but are likely to be around lunchtime on the Thursday and Sunday. Cobham is about a 1 hour drive from Wargrave, depending on M4 and M25 traffic. The address details are: Walton Firs Activity Centre, Convent Lane, Cobham, Surrey and the satnav postcode is KT11 1HB. Permission to Camp forms including a comprehensive equipment list will be issued nearer the time. Scouts will need to bring at least a 3 season sleeping bag, and a camping mat. Scouts must also bring and wear strong hiking boots for the hike (no trainers, flip-flops, wellington boots or crocs will be allowed). We anticipate that the total cost per Scout will likely be between £85 to £100 depending on numbers attending. This includes camp fees, all activities (many of which are external instructor lead), entrance to the historic Brooklands Motor Museum, Concorde Experience and the 4D Theatre, as well as all meals for the 4 Days. There will be 2 Uniformed Leaders (Pete Walsh and Paul Worthington) attending this camp. This means that the maximum number of Scouts we can look after is 24. The minimum number to make the camp viable is 12. 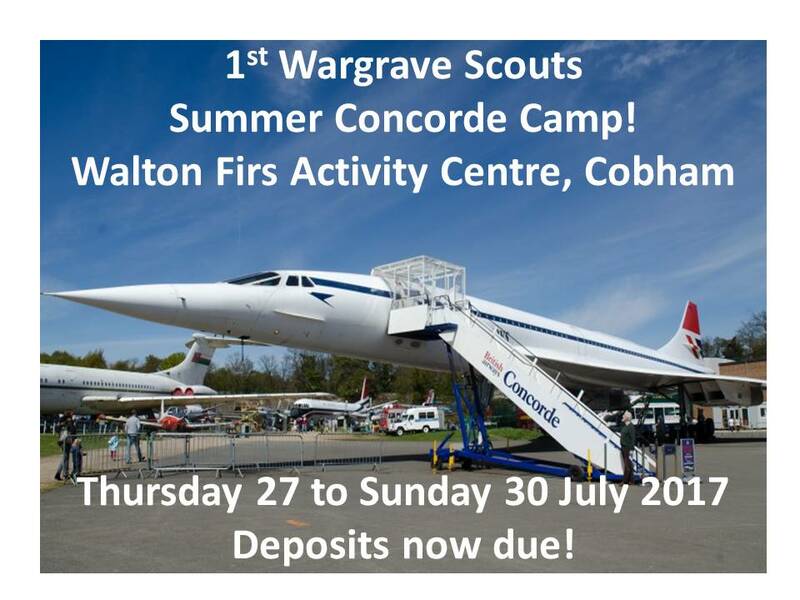 We are now taking deposits from Scouts that would like to join our Concorde Summer Camp adventure! Please note deposits should be considered as non-refundable. Deposits will only be refunded ONLY if another 1st Wargrave Scout is found to take your place before the event. Places are offered on a first come first served basis, and must be secured by providing a DEPOSIT CHEQUE for £25 payable to “1st Wargrave Scouts” OR BY CASH. Please hand your deposit to Pete Walsh by no later than Monday 22nd May, so the last troop evening before the Whitsun half-term. The balance, due by cheque must be paid no later than Monday 26th June. If you have any questions please email Pete Walsh, Scout Leader at scouts@wargravescouts.org.